What are your goals in handball going forward: I would like to continue to compete in tournaments and stay competitive against the best players around my age. I hope to continue to compete on the SR48 tournament circuit. What are your goals for Houston and the SR48 season: I hope to win. How will you prepare for Houston: A lot of cross training, especially wind sprints; additionally, I’ve been driving all over the Southeast to play guys like Luis Cordova (Florida), Scott Kelley and Rob Pearse (Tennessee). What do you love about handball: I love the competition, the great workout you get from playing, and the friends you develop over the years. Favorite pro player (now or ever): Probably John Bike and maybe Dave Lynch. I had the privilege of playing both of these guys every week for about two years in Tucson, AZ in the mid 90s…and they both beat me all the time, but I learned a lot playing them. How would you describe your game: I would like to be a shooter; however, since I can’t kill the ball very well, I guess I’m more of a defensive player who can rally. What is your best shot: I used to have a pretty good back wall kill shot; however, that shot seems to allude me from time to time now! I think now my best shot is really just trying to play percentage handball. Given the choice, what top SR48 would you most like to play: I’ll answer this question by saying the player I’d LEAST like to play is Naty Jr…I don’t think any of the SR48 players want to play him! Who has inspired you to play this game at such a high level: My dad. He was a very strong open/masters player in his prime. I always enjoy it – and play inspired – when he’s at a tournament watching me play. Who do you think is the best player of all time: Hard to say – but Naty Sr, Fred Lewis, Dave Chapman, Tati Silveyra, and now Paul Brady would all get a vote from me. Which current Race 4 Eight (not senior) pro would you have most liked to play in your prime? The guys who are inclined to hit a pass shot periodically are the ones that I might have been able to get a few points on. 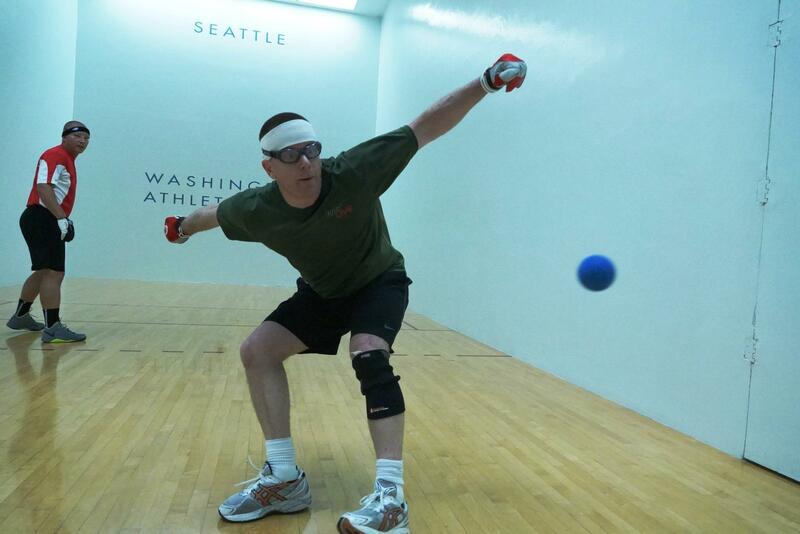 Long known as the nicest guy in handball, Andy Schad added the inaugural 2013 Senior Race 4 Eight Player’s Championship title to his impressive handball resume. A perennial qualifier and top 12 ranked pro in the mid 1990’s, Schad possessed the ability to track every ball down and extend nearly every rally into double digits. At 43, very little has changed. Schad has maintained his fitness and commitment to playing percentage handball and as a testament to Schad’s fitness and level of play into his 40’s, he nearly defeated then #12 WPH pro Vic Perez in a Race 4 Eight qualifier last season, holding match point before eventually falling 26-24. Andy Schad started playing handball as soon as he could walk, following his dad to the courts to learn the game. Schad was inspired to play by his dad, a very strong open and master’s player in his prime. Schad is still inspired today when his dad travels to tournaments to watch him play. Schad was initially coached by his dad and later coached in college by Frank Swehosky. Currently residing in Montgomery, Alabama on temporary military duty as a Federal Agent in the Air Force Office of Special Investigations, Schad permanently lives with his wife and daughters in Washington D.C. Schad spent several years in the mid 1990’s living in Tucson, AZ and sparred weekly with John Bike and Dave Lynch. “Having the opportunity to play both of those guys every week was a privilege and even though they beat me all the time, but I learned a lot about the game playing them.” Schad has spent much of his military career living in the Middle East, being forced to put away his handball gloves and playing basketball to stay fit. Schad fine-tunes his handball game between Senior Race events by playing the best players in the southeast, including R48 I Elite 8 Luis Cordova, Jr., Rob Pearse, Scott Kelly, and Mike Morgan. While living in Washington D.C., Schad frequently plays against Dan Zimet, Logan Foley, and Lee Anderson. Schad also incorporates a rigorous cross-training regimen consisting of grueling wind sprints to build his endurance and stamina. Cross training is essential to Schad’s playing style, which he describes as being a “rally-minded” defensive player. Schad is well known for possessing one of the best back wall kill shots in handball in the last 20 years. Schad owns a number of prestigious handball titles and victories. “Beating David Silverya in a pro stop in 1999, beating John Bike in the SR48 Player’s Championship in 2013, and defeating Chris Watkins and John Robles in the 2012 and 2013 master’s nationals doubles were undoubtedly my most satisfying and important handball victories.” Schad would say after defeating Bike to win the SR48 Championship that he had never beat him in hundreds of practice matches or dozens of tournament matches. What a time to break through! Schad cites John Bike and Dave Lynch as his all-time favorite pro players. He believes that Naty Alvarado, Sr., Fred Lewis, David Chapman, Tati Silverya, and Paul Brady are the greatest players to have ever played the game. As Schad enters his mids 40’s, he would like to be able to play against the best players of his generation and to compete on the Senior Race 4 Eight tour. Schad loves the competition, the great workout, and the great friendships that handball provides. Winning more SR48 events would certainly help him love the game even more! Schad’s favorite tournaments are any events in which his wife and daughters can travel with him.